Interactive data explorers can help refine questions for better collection and suggest new areas of inquiry. Data explorers often attempt to filter sets of data to reveal patterns in expected behaviorn described by an axis. For example, user experience patterns can be uncovered by installing behavior tracking in mobile applications. Data explorers can also incorporate predictions modeled from proprietary data sources. No matter what the source of the data might be, carefully defining the graph’s dimensions and filtering mechanisms can help reveal interesting patterns hidden inside a complex tracking system. 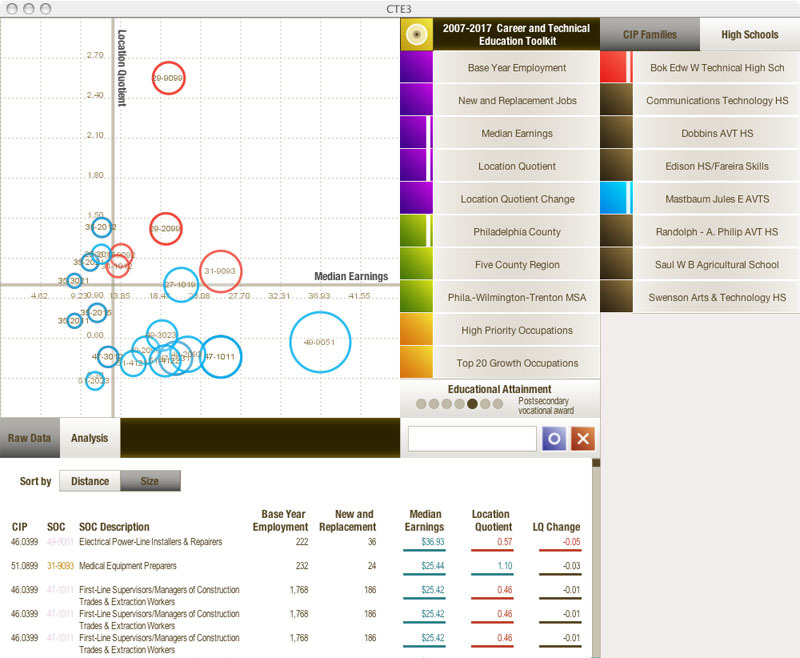 The first piece of software I wrote professionally was a data explorer built for the Philadelphia Workforce Investment Board on behalf of the Philadelphia School District in 2008. 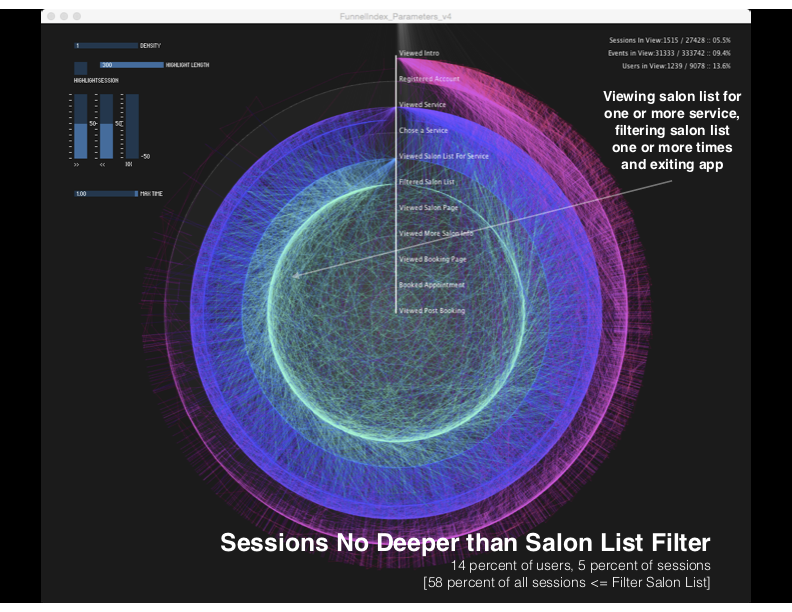 The data explorer was written in Processing, a Java-based library that simplifies programming for visual designers. The Career and Technical Education Explorer compared the vocational programs found in Philadelphia’s school system to the number of jobs projected to be available for graduates inside the metropolitan statistical area over a ten year time span. The explorer could be modified on several dimensions including subject matter, geography, and high school. In the image above, two Philadelphia high schools are compared to see which school prepares students for the highest wages inside of the Philadelphia County. Behavior tracking is common in almost all iOS applications. In addition to attaching common tracking systems to the purchase flow in Beautified, I also sent raw event information from mParticle to an AWS bucket. 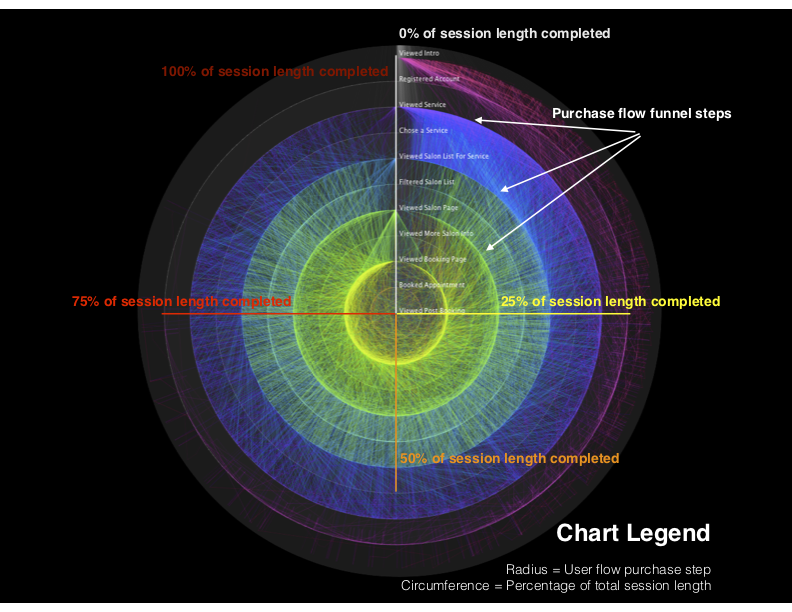 The graphs below are screenshots from an interactive data explorer built in Processing that reveal the step a typical user might end their session before getting to the point of sale. Every user session in the collection is presented on a time based axis that flows around the origin. Each step in the purchase flow is presented in a different color, at a different radius, so that a trip from the outer circle to the inner circle shows how far a single user penetrated into discovering and then buying a product. The product owners could use the explorer to develop a sense of how well the design was pushing users across the purchase flow over the course of a single session. Data explorers can not only be useful but also graceful. In the explorer below, I assigned characteristics from a spreadsheet of contacts to soft-body agents. Filtering through the various characteristics drives a reorganization of the agents into new groups, so that a sense of belonging is demonstrated. The fluidity of the behavior lends some personality to the agents, and self-organization of flocking systems is a trait that might be further refined. We seem to recognize relative motion almost as well as we see color, position, and size, agent-based behavior. Every so often, I expect to come back to this topic to see where technology and art can produce a more natural interface for data exploration.